Physical characteristics: As is typical with most birds of paradise, the male of the ribbon-tailed astrapia species is both larger and more colorful than the female. Males average 12.6 to 13.8 inches (32 to 35 centimeters) in body length, and 0.30 to 0.36 pounds (134 to 164 grams) in weight. 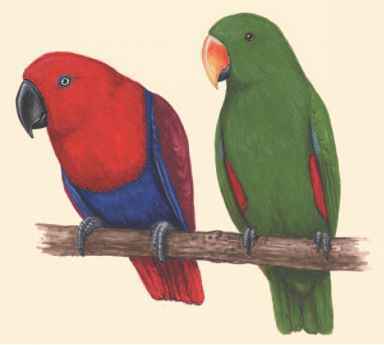 Their plumage is primarily iridescent green, blue, and olive, with a bright green bib and cap and a band of red across the chest. A dark green tuft sits at the top of the beak. The male ribbon-tailed astrapia's most striking feature is his long, white tail feathers, which extend an additional 8 to 15 inches (20 to 38 centimeters) past his body and are tipped with black at the bottom. Females lack the long tail feathers, and are brown in color. 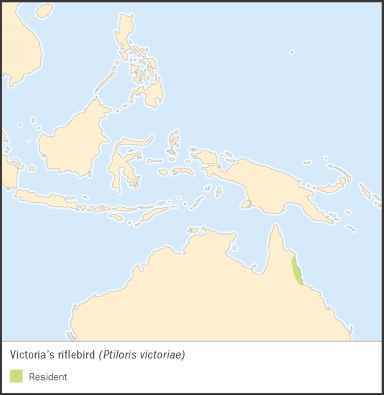 Geographic range: The ribbon-tailed astrapia lives in the tropical and subtropical rainforests of central Papua New Guinea. Habitat: The ribbon-tailed astrapia lives in upper montane (mountainous) and subalpine forests and forest edges. Diet: These birds use their bill to dig insects out of the ground and trees. About half of their daily diet is comprised of fruit. Behavior and reproduction: Males are polygynous, meaning that they breed with multiple females. They attract mates through a courtship ritual known as lekking, in which they gather together with other male astrapias and sing together, hop from perch to perch, and display their plumage to draw female mates. Breeding season takes place for the greater part of the year (May through March). Female ribbon-tailed astrapias lay a single egg at a time, which incubates for about three weeks. 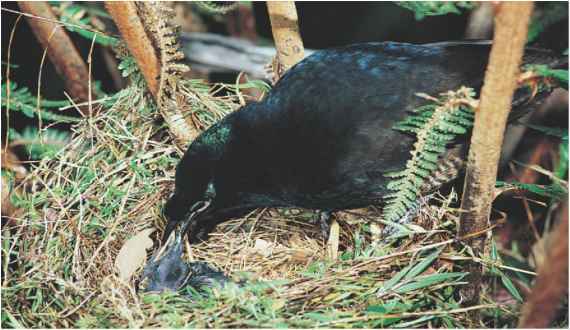 The females are solely responsible for both building their nest (which is deep and cup-shaped) and feeding their hatchlings. Ribbon-tailed astrapias and people: Ribbon-tailed astrapias have little contact with humans. However, males are sometimes hunted by native populations for their colorful tail feathers and skins.